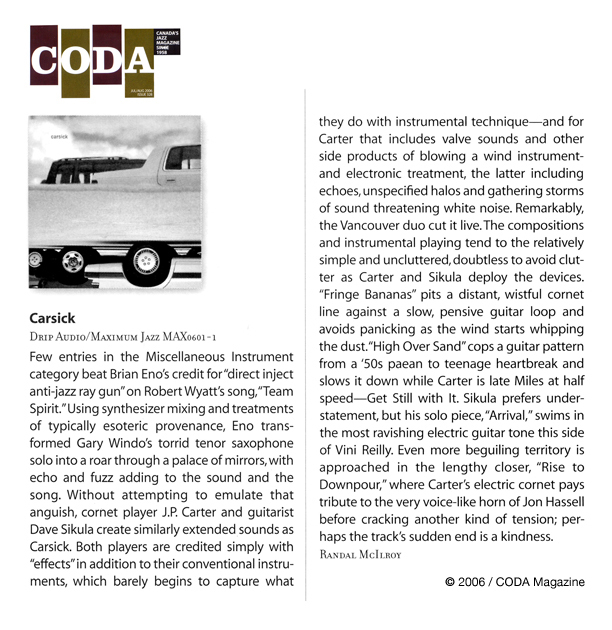 Carsick, a new duo based out of Vancouver, involves JP Carter and Dave Sikula of the critically acclaimed post-rock jazz quartet Inhabitants. The Calgary Sun calls their music ��dense & mind-bending�like a jazz revolution waiting to happen.�. 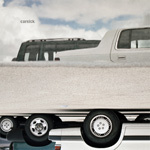 Carsick was made with only a Cornet (type of trumpet), a guitar and a floor full of pedals. It was recorded live by award-winning producer/musician Jesse Zubot at the Jack Shadbolt Centre in Burnaby, BC. The music of Carsick ranges from beautiful jazz-tinged melodies to improvisational bursts to epic, noise-inspired soundscapes. The duo reaches some truly amazing sonic peaks with just two instruments at their disposal. Their work could please fans of ambient stalwarts Brian Eno, Jon Hassell, & Daniel Lanois just as easily as it could fans of Miles Davis, Tortoise or Sigur Ros. JP Carter and Dave Sikula have worked with artists as diverse as Dave Douglas, Bill Laswell, Wayne Horvitz, Dr. Lonnie Smith, Peggy Lee, Brad Turner and many others. At the 2005 Vancouver Int�l Jazz festival their band, Inhabitants, won the CBC�s Galaxie Rising Star Award.